This is a written version of the brief talk I gave at the hearing of the EU parliament on energy security in Brussels on Nov 5, 2014. It is not a transcription, but a shortened version that tries to maintain the substance of what I said. In the picture, you can see the audience and, on the TV screen, yours truly taking the picture. Ladies and gentlemen, first of all, let me say that it is a pleasure and an honor to be addressing this distinguished audience today. 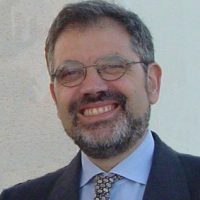 I am here as a faculty member of the University of Florence and as a member of the Club of Rome, but let me state right away that what I will tell you are my own opinions, not necessarily those of the Club of Rome or of my university. This said, let me note that we have been discussing so far with the gas crisis and the Ukrainian situation, but I have to alert you that there is another ongoing crisis – perhaps much more worrisome – that has to do with crude oil. This crisis is being generated by the rapid fall in oil prices during the past few weeks. I have to tell you that low oil prices are NOT a good thing for the reasons that I will try to explain. In particular, low oil prices make it impossible for many oil producers to produce at a profit and that could generate big problems for the world’s economy, just as it already happened in 2008. 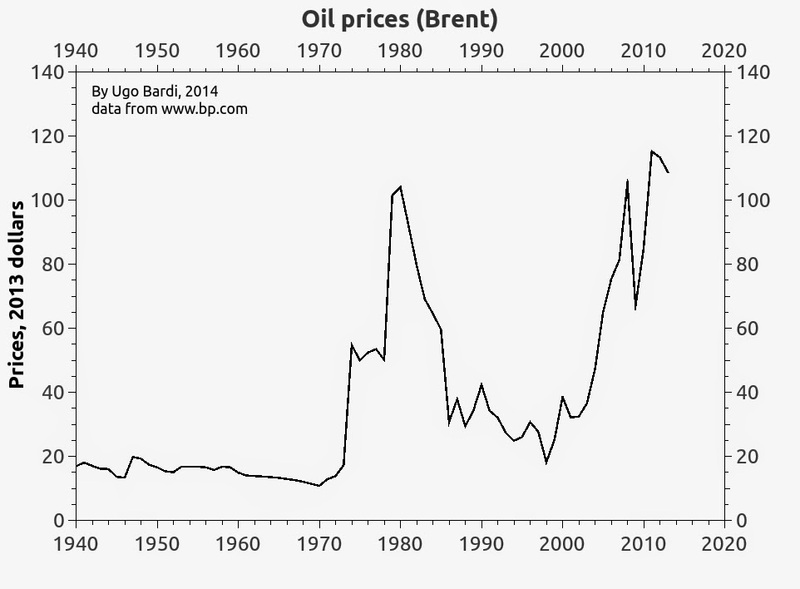 So, let me start with an overview of the long term trends of oil prices. Here it is, with data plotted from the BP site. These data are not corrected for inflation, but the correction is not large in this time range. 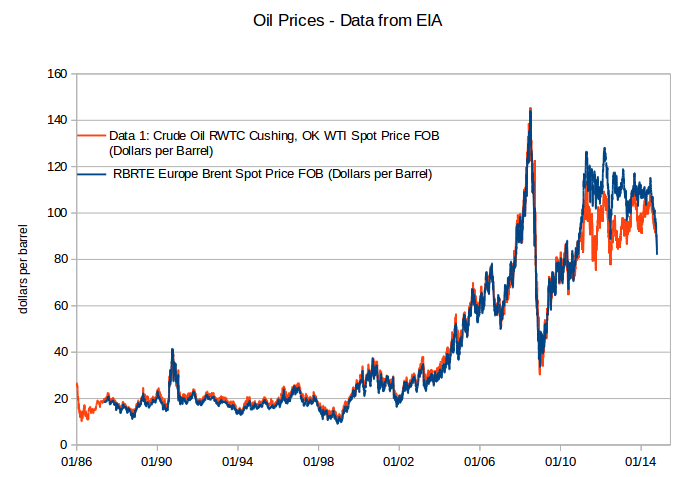 Prices are growing, but they stabilized during the past 4-5 years at somewhere around US 100 $ per barrel. Note the fall during the past month or so. I plotted these data about one week ago, today we are at even lower prices, well under 80 dollars per barrel. The question is: what generates these trends? Obviously, there are financial factors of all kinds that tend to create fluctuations. But, in the end, what determines prices is the interplay of demand and offer. If prices are too high, people can’t afford to buy; that’s what we call "demand destruction". If prices are too low, then it is offer that is destroyed. Simply, producers can’t sell their products at a loss; not for a long time, at least. So there is a range of prices which are possible for oil: too high, and customers can’t buy, too low, and companies can’t sell. Indeed, if you look at historical prices, you see that when they went over something like 120 $/barrel (present dollars) the result was a subsequent recession and the collapse of the economy. Ultimately, it is the cost of production that generates the lower price limit. Here, we get into the core of the problem. As you see from the price chart above, up to about the year 2000, there was no problem for producers to make a profit selling oil at around 20 dollars per barrel. Then something changed that caused the prices to rise up. That something has a name: it is depletion. Of course, these data are to be taken with caution. But there are other, similar, estimates, including a 2012 report by Goldman and Sachs, where you can read that most recent developments need at least 120 $/barrel to be profitable. Here is a slide from that report. 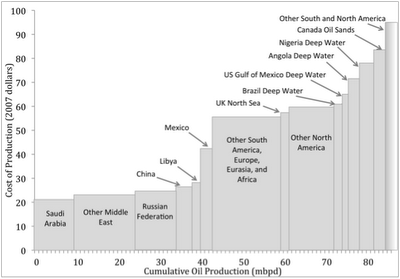 So, you see that, with the present prices, a good 10% of the oil presently produced is produced at a loss. If prices were to go back to values considered "normal" just 10 years ago, around 40 $/barrel, then we would lose profitability for around half of the world’s production. 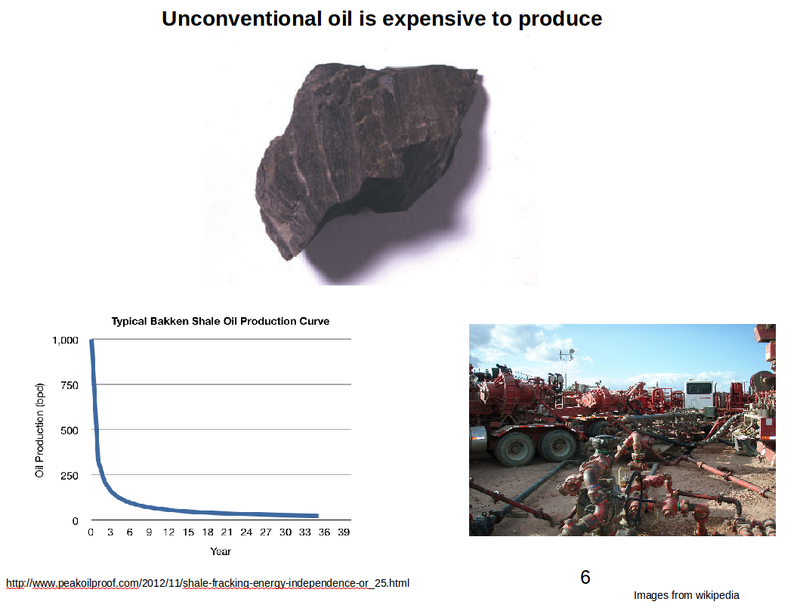 Production won’t collapse overnight: a good fraction of the cost of production derives from the initial investment in an oil field. So, once the field has been developed, it keeps producing, even though the profits may not repay the investment. But, in the long run, nobody wants to invest in an enterprise at so high risks of loss. Eventually, production must go down: there will still be oil that could be, theoretically, extracted, but that we won’t be able to afford to extract. This is the essence of the concept of depletion. That object you see at the top of the image is a chunk of shale. It is the kind of rock out of which shale oil and shale gas can be extracted. But, as you can imagine, it is not easy. You can’t pump oil out of shales; the oil is there, but it is locked into the rock. To extract it, you must break the rock down into small pieces; fracture it (this is where the term "fracking" comes from). And you see on the right an impression of the kind of equipment it takes. You can be sure that it doesn’t come cheap. And that’s not all: once you start fracking, you have to keep on fracking. The decline rate of a fracking well is very rapid; we are talking about something like a loss of 80% in three years. And that’s expensive, too. Note, by the way, that we are speaking of the cost of production. The market price is another matter and it is perfectly possible for the industry to have to produce at a loss, if they were too enthusiastic about investing in these new resources. It is what’s happening for shale gas in the US; too much enthusiasm on the part of investors has created a problem of overproduction and prices too low to repay the costs of extraction. So, producing this kind of resources, the so called "new oil" is a complex and expensive task. Surely technology can help reduce costs, but think about that: how exactly can it reduce the energy that it takes to break a rock into fine dust? Are you going to hammer on it with a smartphone? Are you going to share a photo of it on Facebook? Are you going to run it through a 3D printer? The problem is that to break and mill a piece of rock takes energy and this energy has to come from somewhere. Eventually, the fundamental point is that you have a balance between the energy invested and the energy returned. It takes energy to extract oil, we can say that it takes energy to produce energy. The ratio of the two energies is the "Net Energy Return" of the whole system, also known as EROI or EROEI (energy return of energy invested). Of course, you want this return to be as high as possible, but when you deal with nonrenewable resources, such as oil, the net energy return declines with time because of depletion. Let me show you some data. 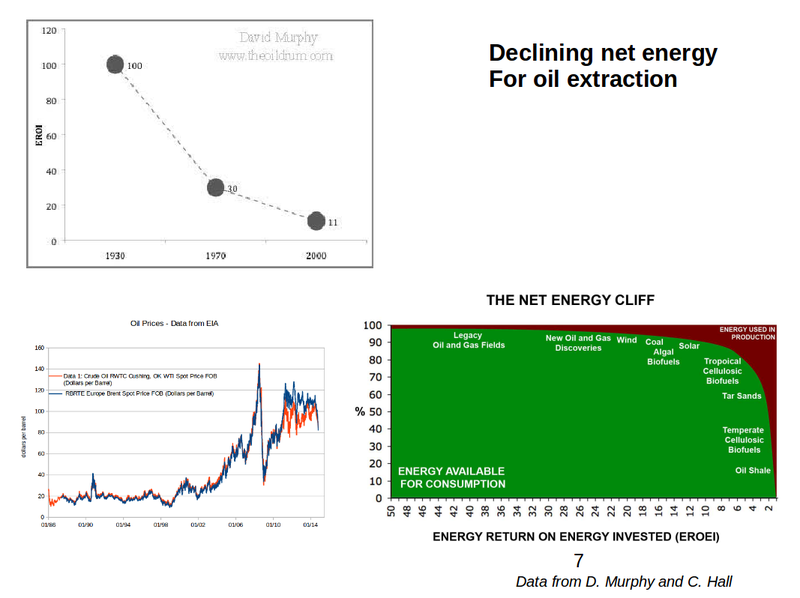 As you see, the net energy return for crude oil (top left) declined from about 100 to around 10 over some 100 years (the value of 100 may be somewhat overestimated, but the trend remains correct). And with lower net energies, you get less and less useful energy from an oil well; as you can see in the image at the lower right. The situation is especially bad for the so called "new oil", shale oil, biofuels, tar sands, and others. It is expected: these kinds of oil (or anyway combustible liquids) are the most expensive ones and they are being extracted today because we are running out of the cheap kinds. Then, no wonder that prices must increase if production has to continue at the levels we are used to. Then, when the market realizes that prices are too high to be affordable, there is the opposite effect; prices go down to tell producers to stop producing a resource which is too expensive. So, we have a problem. It is a problem that appears in the form of sudden price jumps; up and down, but which is leading us gradually to a situation in which we won’t be able to produce as much oil as we are used to. The same is true for gas and I think that the present crisis in Europe, which is seen today mainly as a political one, ultimately has its origin in the gradual depletion of gas resources. We still have plenty of gas to produce, but it is becoming an expensive resource. It is the same for coal, even though so far there we don’t see big problems – for coal troubles come more from emissions and climate change; and that’s an even more important problem than depletion. Coal may (perhaps) be considered abundant (or, at least, more abundant than other fossil resources) but it is not a solution to any problem. In the end, we have problems that cannot be "solved" by trying to continue producing non renewable resources which in the long run are going to become too expensive. It is a physical problem, and cannot be solved by political or financial methods. The only possibility is to switch to resources which don’t suffer of depletion. That is, to renewable resources. 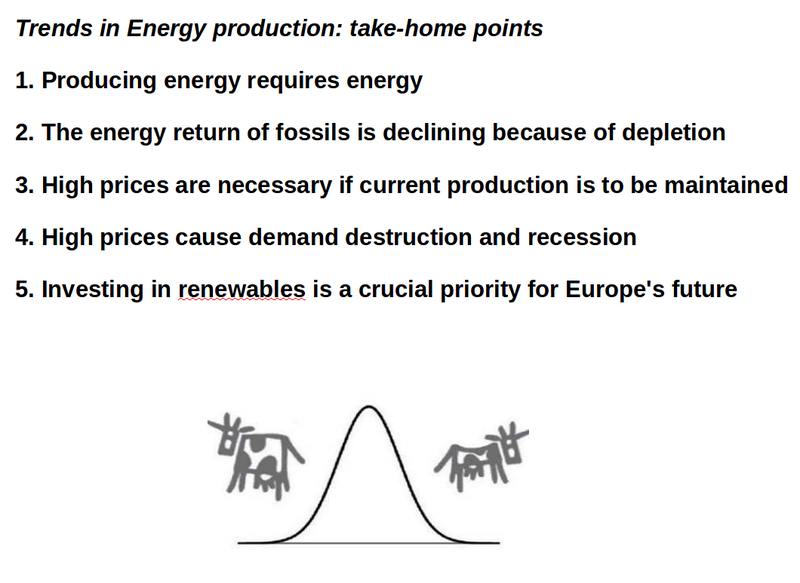 At this point, we should discuss what is the energy return of renewables and compare it to that of fossils. This is a complex story and there is a lot of work being done on that. There are many uncertainties in the estimates, but I think it can be said that the "new renewables", that is mainly photovoltaics and wind, have energy returns for the production of electrical energy which is comparable to that of the production of the same kind of enery from oil and gas. Maybe renewables still can’t match the return of fossils but, while the energy return of fossil keeps declining, the return of renewables is increasing because of economies of scale and technological improvements. So, we are going to reach a crossing point at some moment (maybe we have already reached it) and, even in terms of market prices, the cost of renewable electric power is today comparable to that of electric power obtained with fossil fuels. 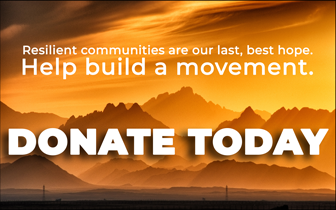 The problem is that our society was built around the availability of cheap fossil fuels. We can’t simply switch to renewables such as photovoltaics, which can’t produce, for instance, liquid fuels for transportation. So, we need a new infrastructure to accommodate the new technologies, and that will be awfully expensive to create. We’ll have to try to do our best, but we cannot expect the energy transition – the "energiewende" – to be painless. On the other hand, if we don’t prepare for it, it will be worse. 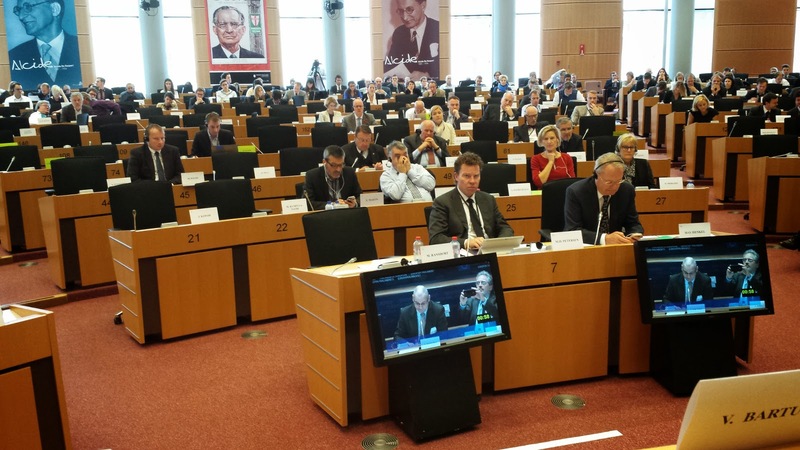 So, to return to the subject of this hearing, we were discussing energy security for Europe. I hope I provided some data for you that show how security is ultimately related to supply and that we are having big problems with the supply of fossil energy right now. The problem can only increase in the future because of the gradual depletion of fossil resources. So, we need to think in terms of supplies which are not affected by this problem. As a consequence, it is vital for Europe’s energy security to invest in renewable energy. We shouldn’t expect miracles from renewables, but they will be immensely helpful in the difficult times ahead. [Resilience.org’s] variety of sources of information, and new voices from different local sources that inspire via their commitment and local activity. Peak Oil, 20 Years Later: Failed Prediction or Useful Insight?